Thankfully we play at home more then we do on the road. 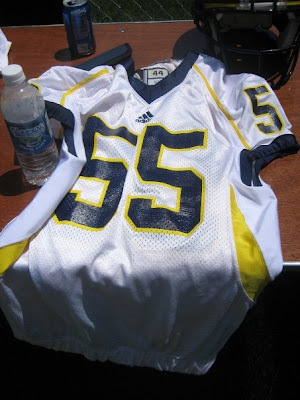 Brian at mgoblog says he had more than a couple people email him with these pics saying they are the true jerseys. 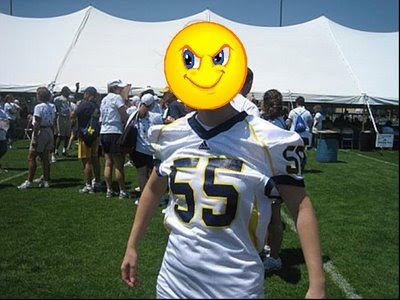 The second pic looks as if it was taken at the Michigan Women's Football camp last weekend. In which case, I would tend to think these are the real deal. Now, they're not too different from the Nike jerseys from last year. The yellow piping looks to be a bit thicker, and of course the yellow inserts on the sides are a new addition (which remind me a lot of WVU road unis...blah!). So its not too far off from last year. But this blogger thinks Adidas, and Michigan coulda and shoulda done better. I suppose we will know if its real as soon as M Den gets them in. I am sure they are chomping at the bit to get the new jerseys in, ugly or not they will sell like flapjacks on a cool Ann Arbor sunday morning. The jerseys look great. I love to get one. Maybe it's the right time to change my old jersey with this.